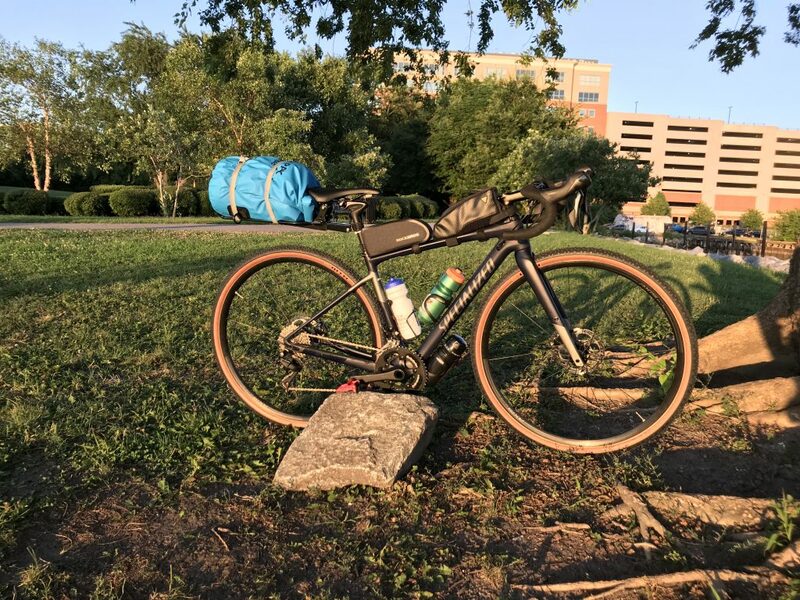 We had decided, after weeks of deliberation that we were going to attempt the route on gravel bikes, essentially road bikes with beefed up tires and a little different geometry. I was sporting my Specialized Diverge and he was opting for his Fuji cyclocross bike. 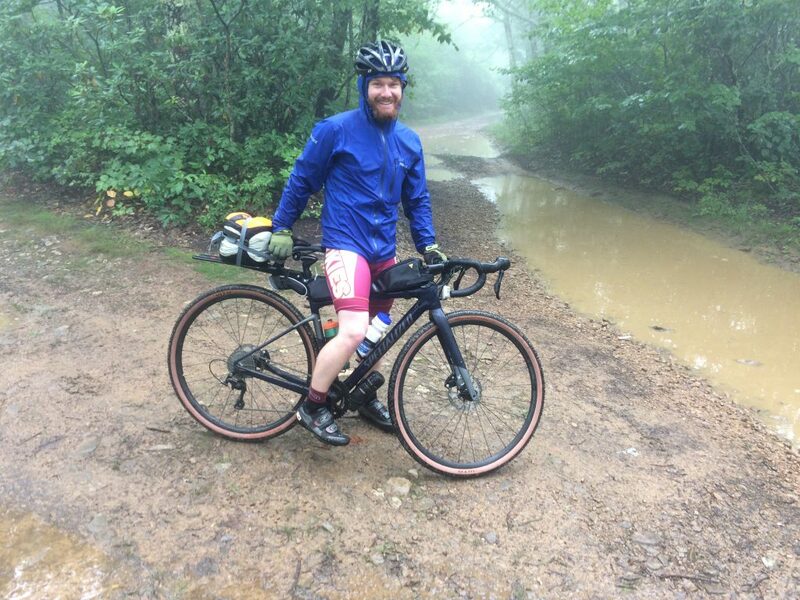 We knew from the description of the Blue Ridge Wrangler that we would likely have to get off and walk our bikes at times and would have hellish descents but wanted an adventure and figured we could always change up the route if need be. We rode just a few miles before setting up camp. 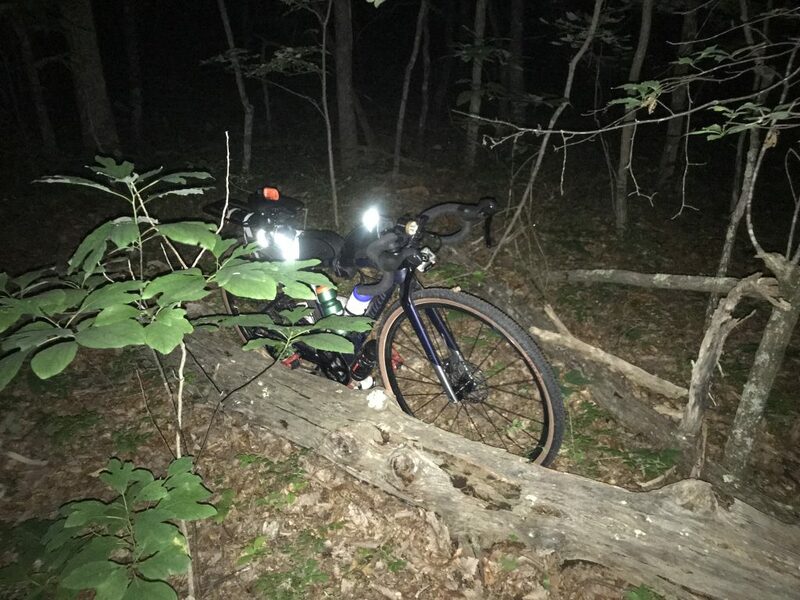 We were exhausted from throwing our bikes over boulders and fallen trees, from pushing them up climbs too steep for our gearing. But as if I hadn’t added enough adventure to the trip, I decided I was going to sleep in a hammock for the first time. 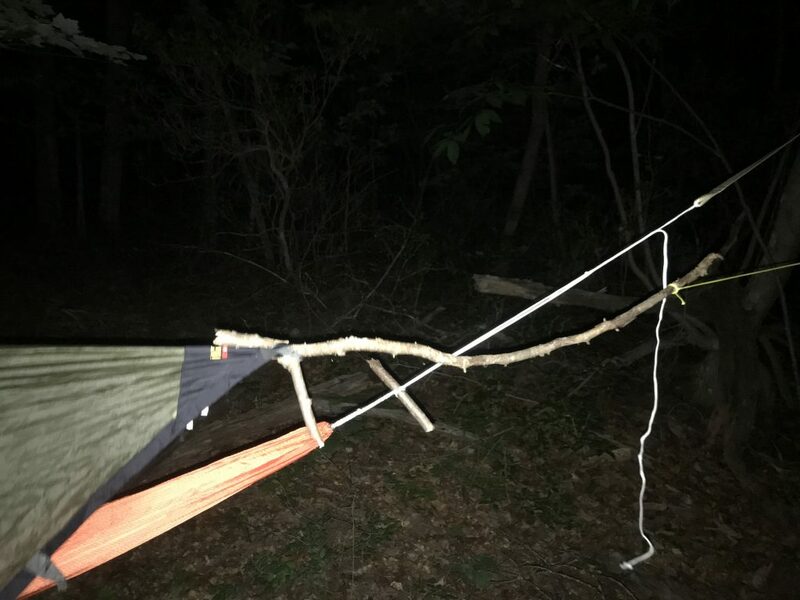 My last summer backpacking trip down in Georgia had been a nightmare with the heat and the bugs and I figured an airy tarp of nylon suspending me in the air would be welcome relief from the sweltering night. But so it turns out, 65 degrees is quite chilly on the rump in a hammock. I shivered much of the night and we laughed about that over breakfast. The next day we decided to descend off the ridge line to cruise on some paved roads up to the Blue Ridge Wrangler’s namesake Parkway. We hit our first climb heading up to the Blue Ridge Parkway and were thankful to be cranking gears on asphalt rather than loose scree. But once we hit the top we began an immediate descent down a harrowing but awesome gravel road. In minutes all the elevation we had spent nearly half an hour gaining was above us and we were back to the grind. We started the second climb nearly as soon as we finished the descent and enjoyed the company of a very friendly, casually trotting dog who joined us for a couple miles. At the top of the climb we made a bit of a descent to our first resupply, the Montebello Country Store where we topped off our rations and stuffed ourselves with ice cream and Coke. After a beautiful stretch of gravel out of Montebello, we enjoyed a descent on the Blue Ridge Parkway, allowing us to rest sore hands and tushes before an epic 14 mile blip on the route out and up to the highest point, a whopping quad burner from 1800 feet to 3500 feet on packed gravel. 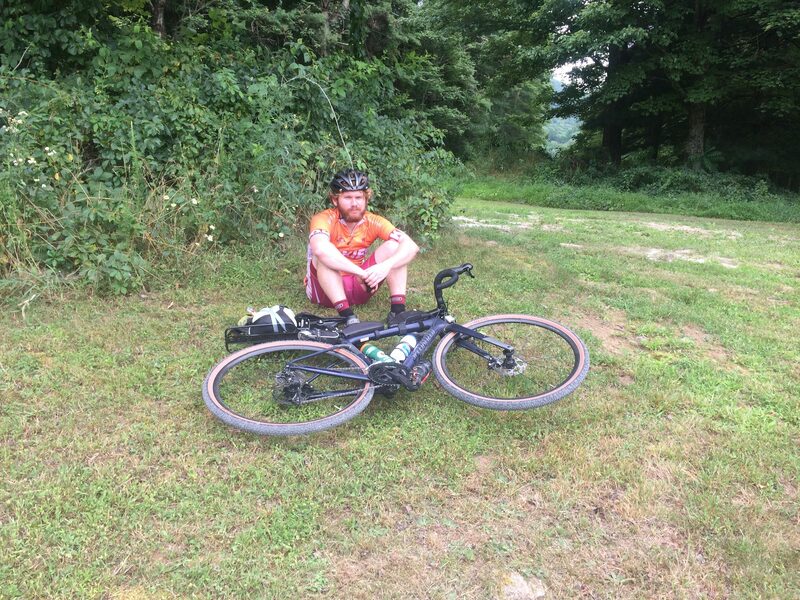 We laid the bikes down in the grass at the summit at an intersection with the Appalachian Trail and collapsed beside them. 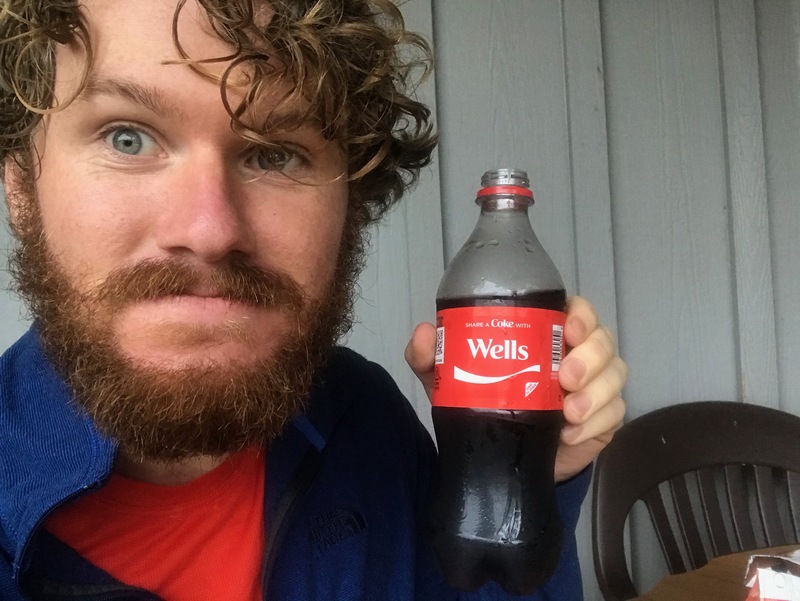 Having biked at most 30 miles in a day for the last couple years and maybe cumulative of a couple hundred miles, I was getting exhausted only 50 miles into the 185 miles of the Blue Ridge Wrangler. But soon to follow was an exhilarating descent on some packed and some loose gravel for nearly a continuous 15 miles. We skidded our rear wheels on berms of gravel at 30 mph as our tires pinged stones off into the woods. Down in the valley we cruised on packed gravel alongside the Pedlar River on false downhill, gently peddling as the day winded down. 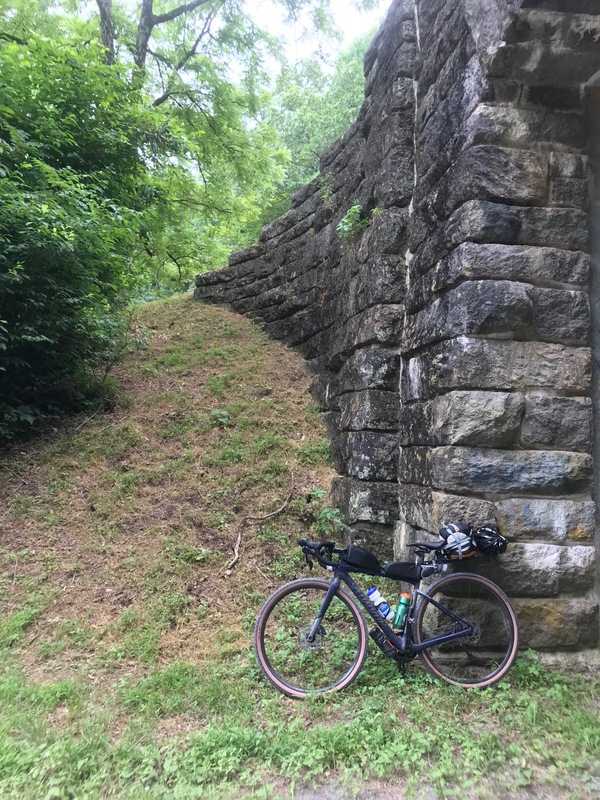 With Scott having to return to work on Monday, we decided to bail on the purportedly pretty gnarly final loop of the ride by cutting the loop short near the Lynchburg Reservoir. And with a little bit of extra time before dark we jumped in a swimming hole in the frigid creek and had fish nip our legs clean. It was the absolute pinnacle to an awesome day, the kind of awe for nature that I feel you can’t quite get without exertion. 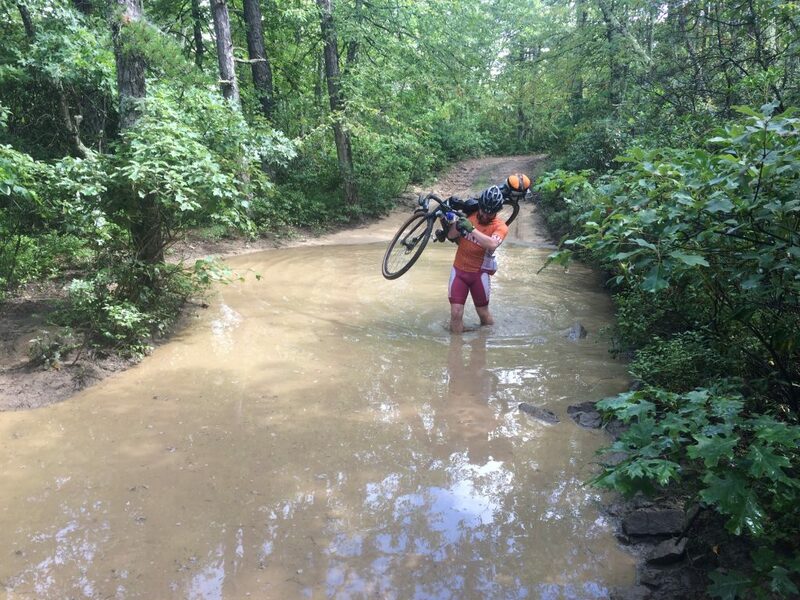 After a long day of riding in the humid summer warmth, there’s nothing quite like a cool rinse in a turbulent creek. We decided to camp along a beautiful campsite alongside the Pedlar River. We were the only ones and set up our hammocks by the river and had a beautiful fire with the calming water beside us. Exhausted from the day of riding and with the temps rising slightly, I slept through the night better than I even sleep at home. The next morning we had a steep climb up from the river and our sore legs and bottoms dreaded another day in the saddle. With a 1300 foot climb to start the day we warmed up quickly. We rejoined the Blue Ridge Parkway briefly for some easy miles before another fun gravel descent down to Irish Creek. 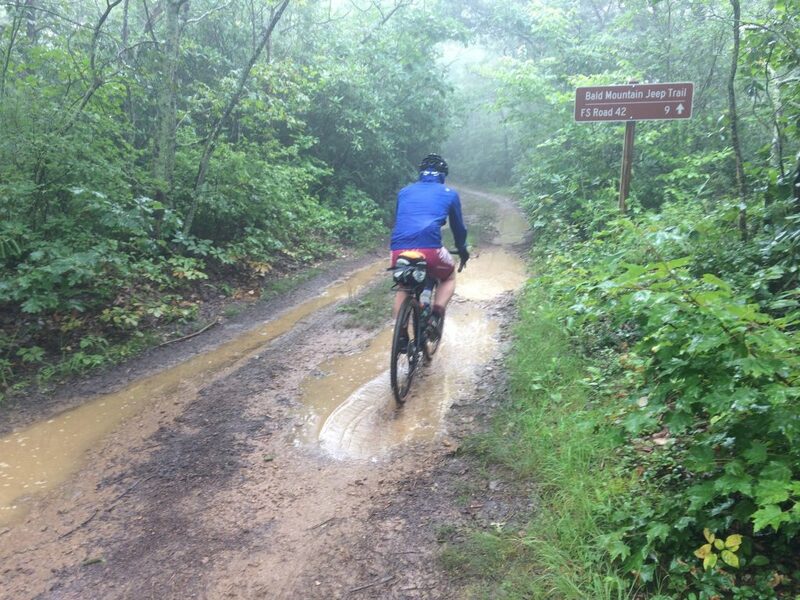 We ditched another bit of singletrack for a more direct gravel climb back up to the BRP. Church was letting out and we were passed by traffic returning home from the rural chapel. About ten cars in total slipped by us on the narrow road, likely doubling the number of cars we had been passed on the nearly hundred miles of riding heretofore. Hitting up the Montebello General Store again, the cashier made a joke about my appetite after seeing us less than 24 hours earlier. And as soon as we walked out with snacks and sodas in hand the sky let loose in a torrent of rain and lightning. Having anticipated this and honestly surprised the weather hadn’t closed in earlier, we were still less than thrilled about leaving the comfort of the general store for the storm. 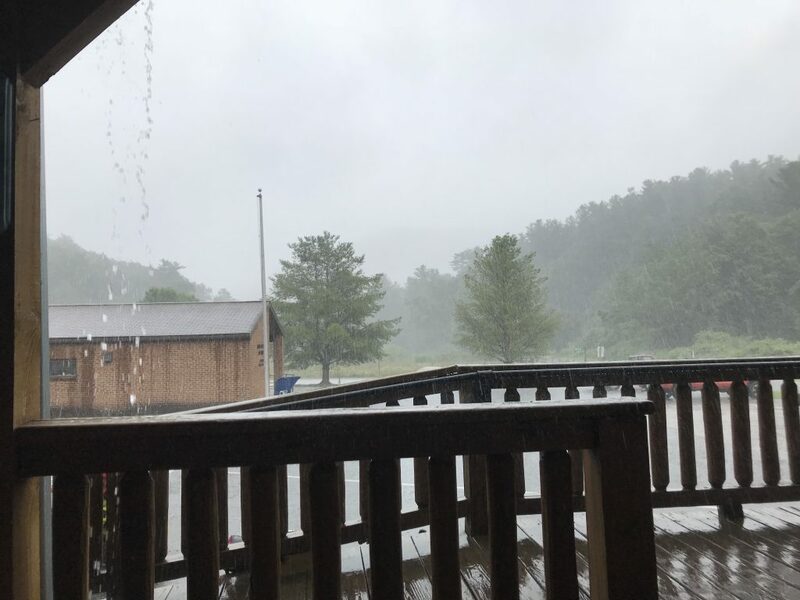 We took our time eating, watched the rain fade to a drizzle and the lighting dissipate, donned rain jackets, and made our way back up the BRP for another short stretch of paved road. 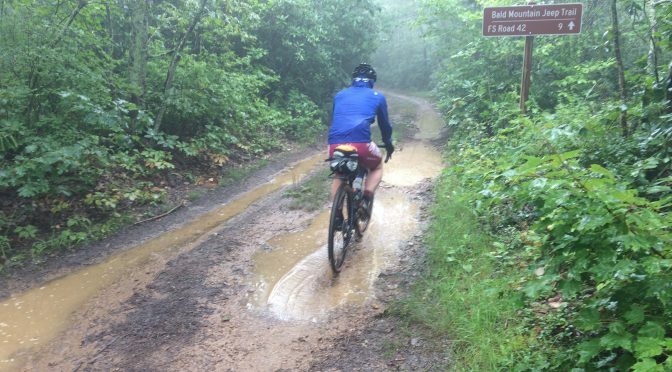 The rain waxed and waned on the flattest stretch of riding we’d had the entire trip until eventually subsiding when we deviated from asphalt back into the woods for a long stretch of fire road to finish the ride off. Back on gnarly trails we laughed and sometimes cursed at our choice of steed. Our lack of suspension jostled us around over small loose stones and large fixed obstructions. We knew we were on a jeep trail and figured how bad could it be if a car could get over it. 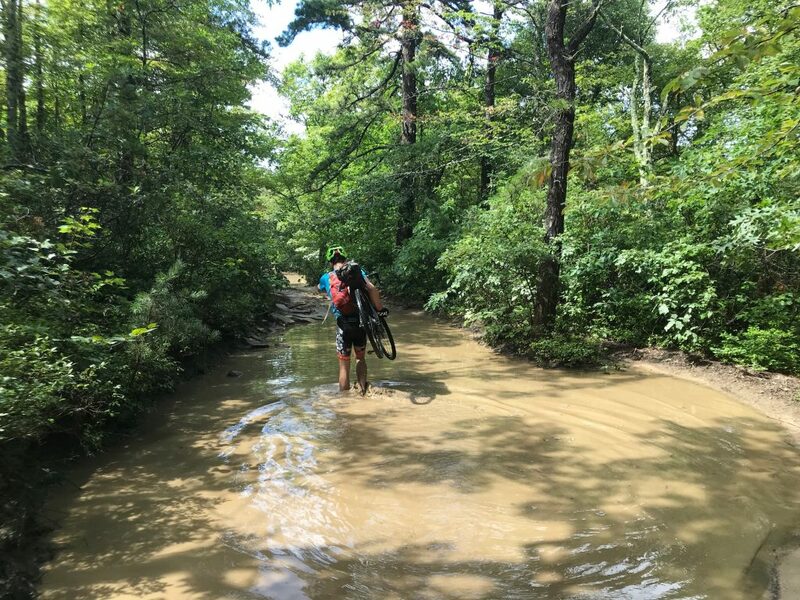 As the trail dove into giant vats of muddy water we learned that vehicles can apparently handle a lot worse terrain than we ever knew. Soon the path dropped downhill and we found ourselves death gripping our hoods to keep from endo’ing onto the rain soaked rocks. We picked our lines carefully and managed to navigate the entire descent without one spill. Our bikes binged and pinged, tires slipping down slabs and shifting from side to side as loose softball size rocks gave way below us. We passed a couple of jeeps navigating their way up the trail and I think they were just as confused about seeing dudes on practical road bikes as we were seeing a four wheeled vehicle clearing the gnar we were speeding down. Our hands ached and forearms burned from gripping the handlebars so tight and we periodically had to rest simply to relieve the pump in our forearms. After a hellish but hilarious 5 mile, 1500 foot descent we rejoined pavement and cruised the last couple miles to the cars. It was an epic trip and a wonderful introduction to bikepacking. Now to get rid of the time trial bike and hardtail mountain bike in favor of a proper epic bikepacking bike! 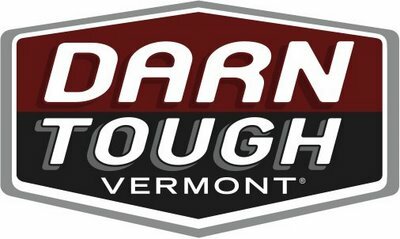 I will say, if anyone is ever considering attempting this entire route on a gravel bike after reading this, DO IT. It is epic and you’re insane. If you like challenging climbs and harrowing descents and less than ideal equipment, you’ll have a blast. If you want to tote around a bulky bike for the 30-40 miles of gnar on a 185 miles route, you’ll probably enjoy yourself way more on the descents, cruise up the climbs, and be cursing yourself on the endless beautiful miles of chill gravel and pavement. If speed on the chill roads isn’t your priority, go with a mountain bike, without question. 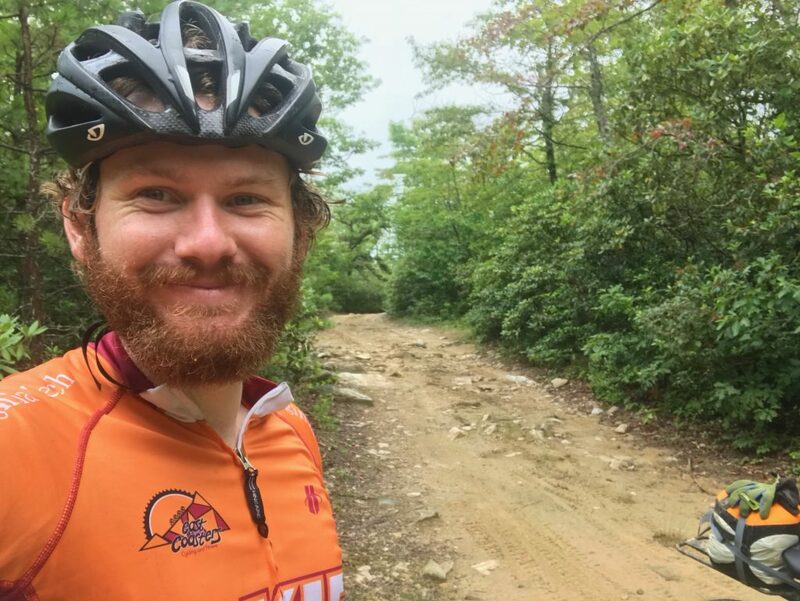 I will say, having only finished 2/3 of the Blue Ridge Wrangler, despite a stubborn lack of regrets from this last trip, I’d probably never attempt the full loop again on a gravel bike. 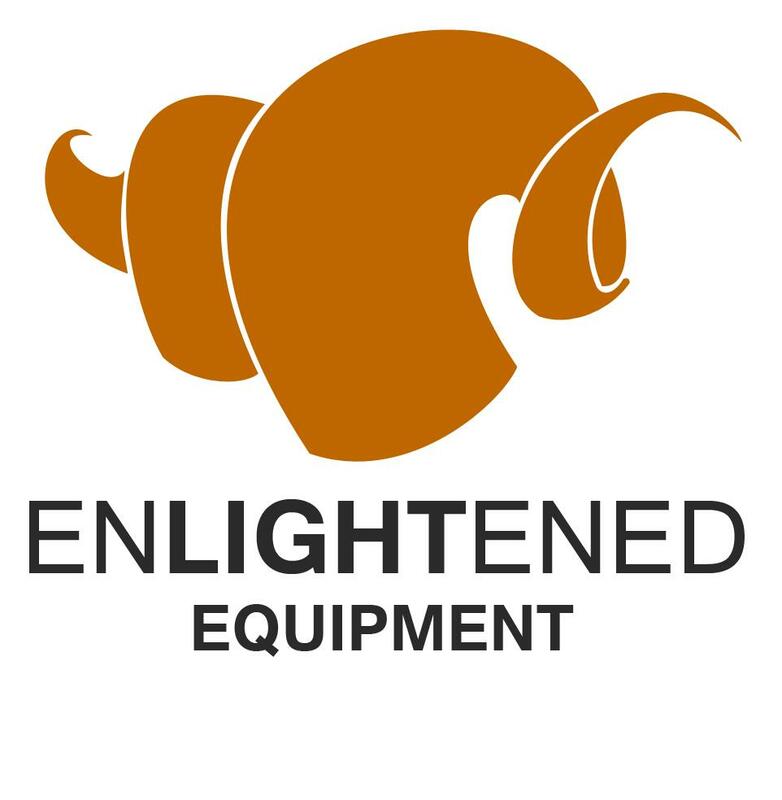 So you think a bike with front suspension or just plan on hike a bike with a rigid bike? Yeah I mean I think I would enjoy it either way. I think a hardtail at minimum would suit most people, depending on level of masochism. thanks for the replies! I am hoping to try it sometime. Even if I can do as much as I can and just enjoy some time outside camping with my bike.